Click Here to visit out Training Academy Portal. Clinical Professionals identifies, fully funds and trains the most talented Life Sciences University Graduates and deploys them into “first to industry” roles (CTA/CRA). This modular training course will initially bring through entry level graduates into a variety of critical roles e.g. CTA (Clinical Trial Administrator), Regulatory Administrator, PV Associate, Data Manager, Medical Information Associate, Quality Assurance Associate and Medical Communications, and as it progresses will develop CRA/RBMs (Clinical Research Associates/Risk Based Monitors) and offer enhanced skills training for Lead CRAs and Project Managers. We have also developed other “pillars” to our training course that encompass; MSL Academy for PhDs and Pharmacists looking to get into their first MSL role, Scientific Academy for graduates looking for their first lab-based role, Med Comms Academy for PhDs and graduates looking for their first role in healthcare communications/PR and Physician to Pharma for physicians looking for their first role in industry. These are unique service offerings from a specialist staffing provider and will begin to assist the unaddressed training needs of the Life Science Industry. *dependent upon graduates completing 12 months of continuous employment with the company they are placed with after training. As a staffing business we have observed a continual upward trend in turnover of both CRO and Pharmaceutical core staff (CTA/CRA/PM etc). Demand for experienced staff is high, but training and development in the basic fundamentals of Clinical Research is diminishing. 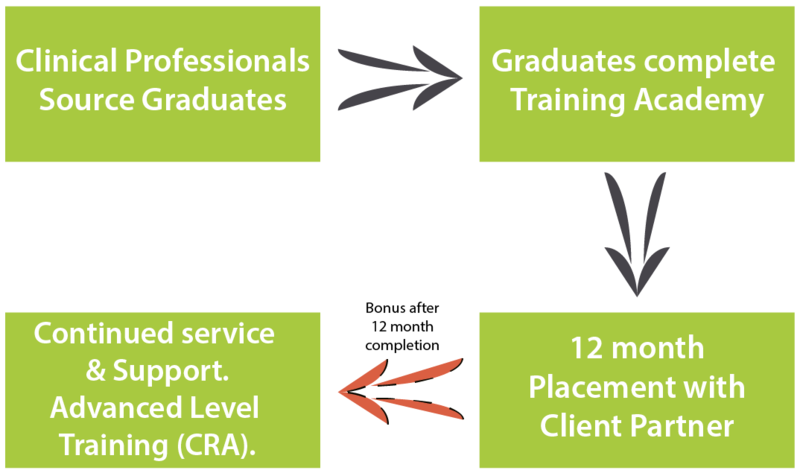 The Graduate Academy scheme is based on a PAYE model contract, with a caveat so that graduates are required to reimburse training costs if they leave the company before completing 12 months of continuous employment, helping improve retention rates. Many of the largest CROs are offering “signing on bonuses” to lure new candidates into the Life Sciences industry, however without providing the appropriate initial training and development. Until the candidate / skill shortages are addressed this escalating turnover of inexperienced staff within pharmaceutical companies and CROs has the potential to impact the future integrity of clinical trials along with perpetuating the continual rise in drug development costs. The Clinical Professionals Academy will address both the new entry level training investment and create an opportunity for the UK’s talented Life Science graduates to start addressing the skilled candidate shortfall in the Life Sciences sector.